Found out around 5 weeks that we were having twins. These are the best images so far. We are going for a 3D u/s in a week to find out what we are having. We really want 2 girls as we already have 3 boys. 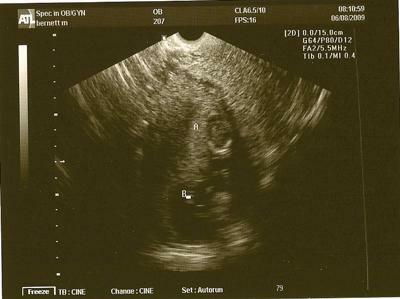 I am 11 weeks pregnant with twins, cant wait for my due date. My 1st born is killing me with questions that he doesn't have a brother or sister, I hope I get a boy and a girl this time. Am so excited. I wish you well. Well I went for my u/s last week and found out that it is two girls! We are so excited but I will feel alot better when I can feel them move more than just sporadically. Wow...I certainly hope you get your 2 girls! You will definitely have your hands full, but at the same time, hopefully you have 3 extra sets of hands to help! I am sending you well wishes for healthy babies and a healthy you!